New Century Theatre is celebrating its 20th anniversary by revisiting favorite productions from their past seasons. 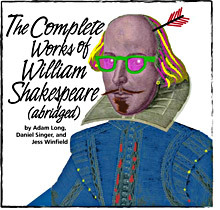 Opening this week is The Complete Works of William Shakespeare (Abridged), which sold out the Academy of Music back in February as part of this year’s Four Sundays in February. If you missed it then, or want to see how it’s evolved in the intervening months, don’t miss this production. We sit down with actors Sam Rush and Phil Kilbourne, plus director Tom McCabe, to find out just how you can cram so much theater into two hours.